High resolution graphics and sophisticated simulation are combined to bring you a motor sports vieogame landmark. Enjoy the thrill of speeding over the world's famous roads, such as the one in sourther France, or the highway which commands a beautiful view of the ALPS, or for those who like to live dangerously, a winding road bordered by sheer cliffs. Also, such realistic features as lane changes uphill and downhill terrain, sudden curves, etc. will keep you constantly on the edge of your seat. 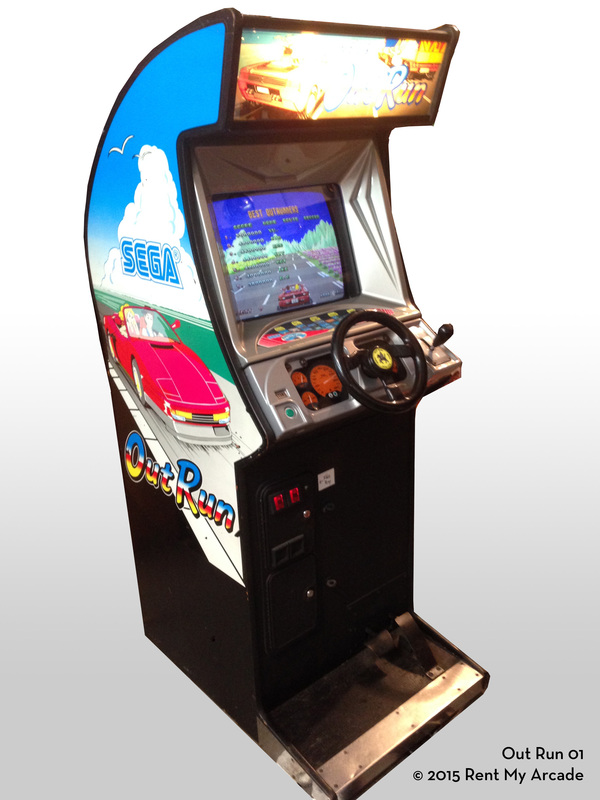 The cockpit accurately follows the movements of the steering wheel, thus allowing the player to fully experience the actual feel of driving a high performance sports car in a race against the clock. Before starting the game, the player may select any one of three available tunes, an inovative feature which is just another in a long line of industry firsts for SEGA. This coupled with a vastly improved stereo sound system, adds a new dimension to the world of videogam music. The sensation of acceleration and cornering that are unique to a high performance sports car have been realistically simulated. For those of you who've always wanted to know just how one of those super machines really handles, here's your chance to find out. The 5 stages with the 15 scenes afford the player a wide variety of picturesque courses. Passing through a checkpoint within the specified time period advances the player to the next stage. The courses are all contained within the 15 branch road scenes in 5 stages. Crossing the finish line or running out of time will terminate the game. When cornering, such driving techniques as slow-in fast-out, out-in-out, etc. can be utilized. Going out of the course or crashing will result in a time loss. H: 71.5", W: 24.75", D: 38.5"